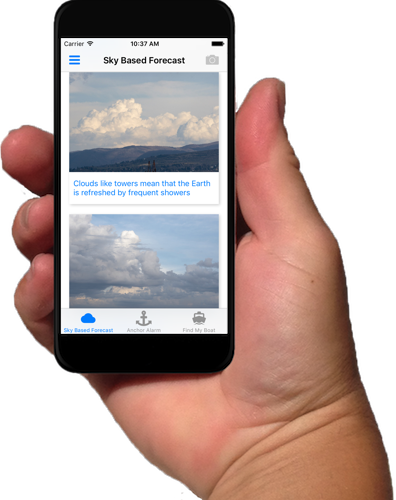 TAKE THE WEATHER FORECAST IN YOUR HANDS. The application will help you predict the upcoming weather in any situation, based on observable signs around you as the shape and amount of clouds, winds and their directions. Take a photo of the sky or pick the picture that is most close to the weather conditions around you and we will provide you with prediction about the most probable development of the weather in the next few hours or days. The application has universal version for iPhone and iPad with information for the needs of land and marine travellers. The Pro version comes with an Anchor alarm with options for late set and pause - in case you forget to set the alarm when you drop the anchor you still can do it later and if you decide to take your device ashore you can pause the alarm and reactivate it later, when you return. The application is always handy since it does not require you to be connected to the internet in order to use it. The app can remember the location of your boat when you leave and will point you to its location later. The application allows you to personalise your experience through customizable settings such as the hemisphere you are currently in, measuring units which are used in the application, color scheme and sounds. The application provides responsive design, customized for different mobile devices. Thus you can use it on your favourite tablet or smart phone. We have created a simple and functional, yet cute design for the application in order to make it straightforward and pleasant to use.